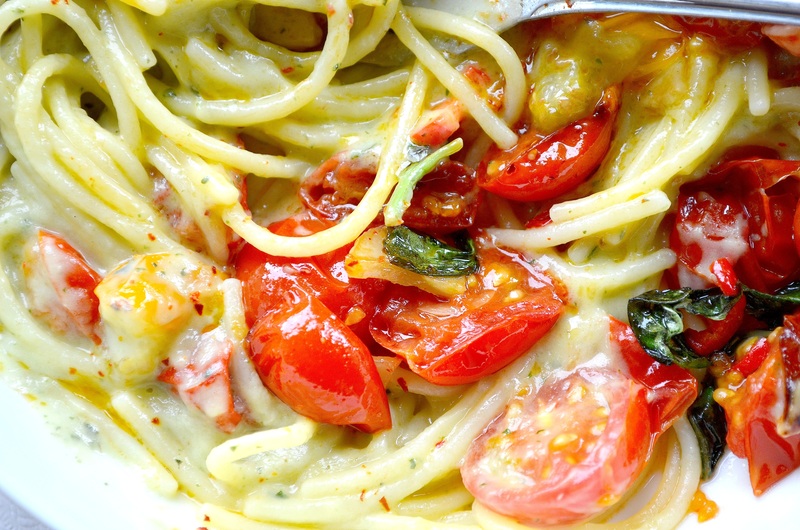 Here is a very tasty dish that takes about 20 minutes and has only 3 or 4 ingredients! What more could one want? Oh! You like it creamy and guilt-free? Well, ticked and ticked my friends! This can be as creamy as you like. Dairy free and suitable for vegans. 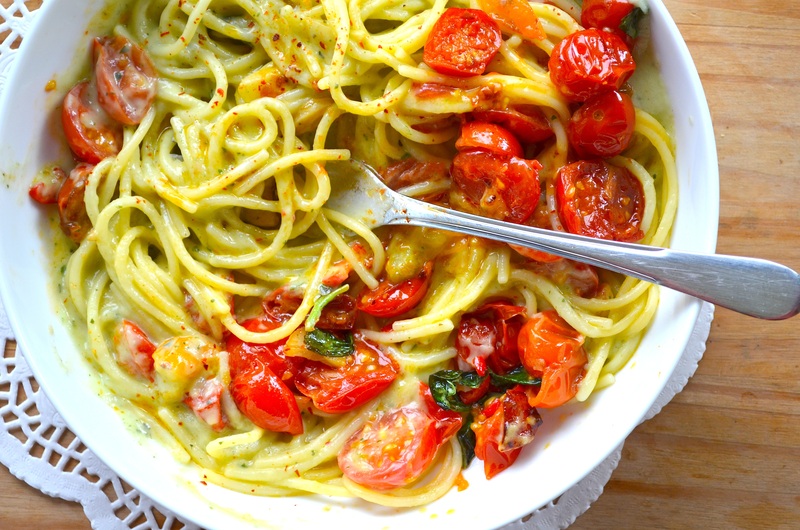 I know it’s only spaghetti with tomatoes but I never add such a thick cream to my food, so it was very pleasing to eat that and not feel guilty. Light, fresh and creamy yumm! 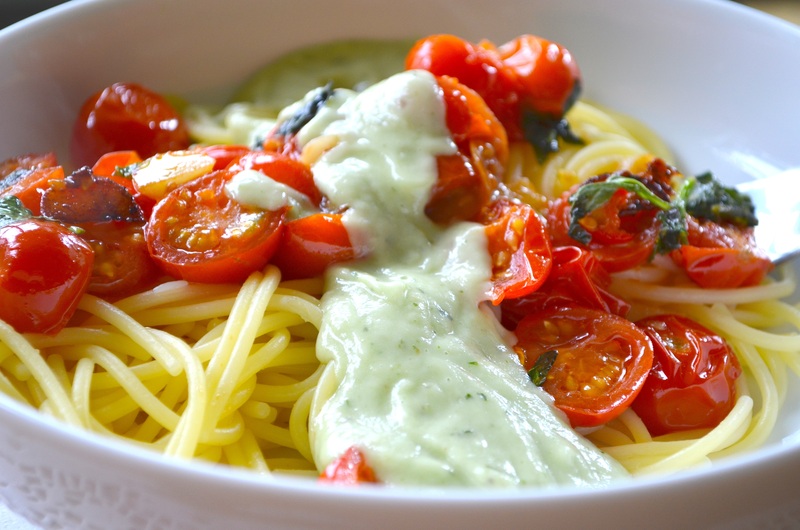 Boil your spaghetti according to the instruction on the packet, meanwhile skin and seed the avocado, put it in the blender with a 3/4 of cup of water, some fresh basil and give it a good blitz until smooth and creamy. You need to achieve the consistency of a thick yogurt. Add more water if you need but try to avoid making it too runny! Season the sauce. Add olive oil to a pan, add finely chopped garlic and the tomatoes on a medium heat until everything is a bit soft and gooey. Add the spaghetti to the pan, pour the sauce on top and mix gently with a fork. Now…isn’t it yummy? 11 Jul	This entry was published on July 11, 2014 at 6:20 pm. It’s filed under DETOX / RAW VEGAN / VEGAN and tagged Avocado spaghetti, healthy spaghetti recipe, Quick supper, Vegan spaghetti recipe. Bookmark the permalink. Follow any comments here with the RSS feed for this post. I love how quick this is and how creamy and delicious it looks. YUM! I’ll have to try this! I love a nice creamy pasta and like you don’t like to use cream. Never thought to use avocado. It’s a great idea and it looks very attractive! Wife made us this tonight! I wondered why he was so keen to go in the kitchen and cook! I think we needed more pasta, Andrew never really manages portions correctly, always too much or too little! What a great sounding sauce!